I often worry about the portability of my ID and any content i create in virtual and web based services. To date this seems to be of little concern to users but when better alternatives to the service you’ve invested so much in become available it would be extremely valuable to be able to tranfer your virtual property easily. If in fact you do own it, you should be able to take it with you. Even using the same name across different systems is not straight forward. Also, I’m not convinced that virtual worlds are a progression on from web2.0. I see them, in the terms of your diagram, as two increasingly overlapping semi-circles. They will be increasingly interoperable with 3D virtual elements embedded in flat web2.0 pages and visa-versa and data freely transferred between the two in various formats but navigating in 3D will not replace navigating hypertext. Yes I have been round the houses with portability and interoperability of profiles – this will have to be addressed at some point soon otherwise the usuability of the intraweb itself will just become too taxing for people juggling hundreds of identities across services. As to your Web 3.0 point. I never said replaced, nothing dies, my point was that hypertext, and graphical web will simply exist inside the virtual world interface – and I don’t necessarily drop it down to just 3D, these are social spaces, more so than 2D which is abstracted to a large degree. So again – not replace, build on. I’m increasingly certain that Virtual Worlds (such as Second Life) really are a progression from, and an extension to ‘Web 2.0’, building on its themes of user generated content and social networking. You mean Web 3.0 is already here? .-= Anand Srinivasan´s last blog ..Submit An Idea To Google Wave Team =-. Thanks for your comments. I think you misinterpreted my post which was not saying web 3.0 = Second Life. 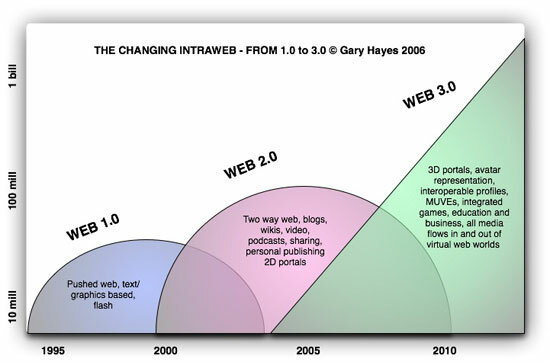 Web 3.0 for me has always been about people communicating more and more in real time over the ‘live’ web (check the diagram). So since I did the post in 2006 we have seen a massive increase in IM type communication using Twitter and live channels on Facebook but I would also disagree in thinking that 3D worlds are not relevant – 80 million users of Farmville for instance mashable.com/2010/02/20/farmville-80-million-users/ (kids? average age of around 31 or so) and steady growth across another 150 social virtual worlds – but while we are on the subject of Second Life it now has its largest concurrency and the first quarter of this year the largest inworld transactions of $600 million. Very insightful post, you just opened my eyes to a lot of different things that I did not know about, that I really should and wanted to learn about, thanks for giving me the inside scoop, I will be back soon to check for updates! A colleague a mine and my self are publishing a book with Springer where we would like to include your fig. 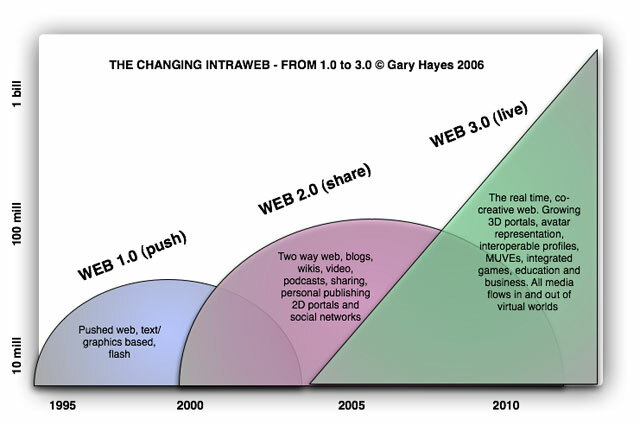 “From Web 1.0 to Web 3.0”, in Hayes, G. (2006). Virtual Worlds, Web 3.0 and Portable Profiles. www.personalizemedia.com/virtual-worlds-web-30-and-portable-profiles/, with your permission. Should it be possible, we would appreciate it dearly.